How does American exceptionalism shape American foreign policy? Conventional wisdom states that American exceptionalism comes in two variations – the exemplary version and the missionary version. Being exceptional, experts in U.S. foreign policy argue, means that you either withdraw from the world like an isolated but inspiring "city upon a hill," or that you are called upon to actively lead the rest of the world to a better future. 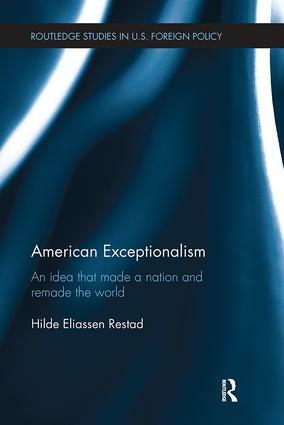 In her book, Hilde Eliassen Restad challenges this assumption, arguing that U.S. history has displayed a remarkably constant foreign policy tradition, which she labels unilateral internationalism. The United States, Restad argues, has not vacillated between an "exemplary" and a "missionary" identity. Instead, the United States developed an exceptionalist identity that, while idealizing the United States as an exemplary "city upon a hill," more often than not errs on the side of the missionary crusade in its foreign policy. Utilizing the latest historiography in the study of U.S. foreign relations, the book updates political science scholarship and sheds new light on the role American exceptionalism has played – and continues to play – in shaping America’s role in the world. This work will be of great interest to students and scholars of US foreign policy, security studies, and American politics.